Pure Criollo "Olvido Cardal" A. S. B† 85 (dam Mangrulla A. S. B. 0217. Sire Man­ullo). Dark Chestnut. Height 1.45 metres (14 h. 1") Heart girth 1.78 metres (70.07") Bred by Pedro and Emilio Solanet at Haras "El Cardal," Argentine. This is an inbred horse his having been also the dam of his sire; his dam a product, since 1887, of selective breeding. For centuries prior to this his ancestors were self-bred in a wild state subject to the privations and severe climatic conditions of life on the Argentine "pampas." This survival through severe natural selection has endowed his race with muscular strength, endurance and mental alertness, and unexcelled stamina of all organs of the body. He is a direct and pure descendant of the Spanish horses brought to the Argentine by the Spaniards during the Conquest period over four hundred years ago. These Spanish horses were largely of Arabian and Barb blood. 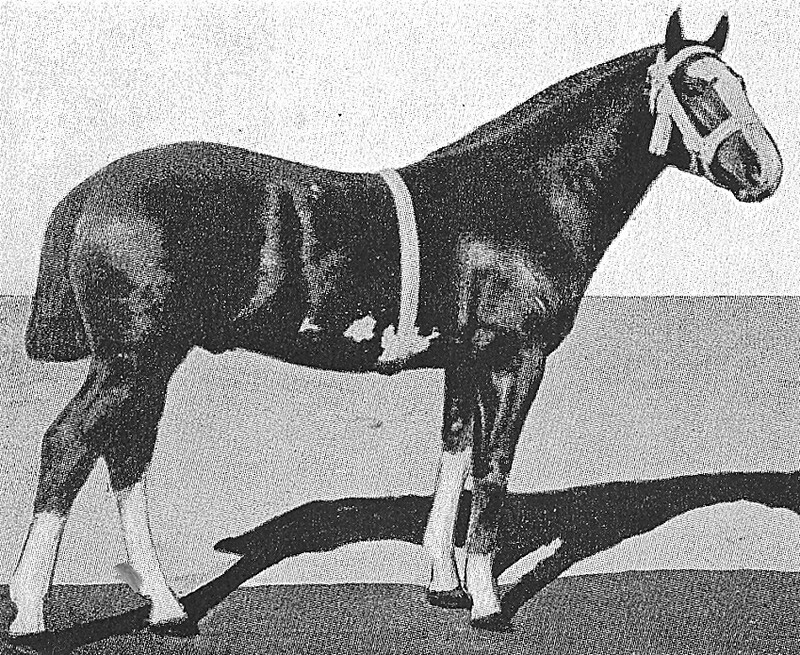 This horse is pictured here in show ring condition, as in the Argentine National Ex­hibition of 1922 he won the championship. Translator's Note: Dr. Solanet is a veterinarian of renown who has made life study of horse flesh. He is a scientific and successful breeder, an authority on the "Criollo" the best strains of which he has the reputation of possessing, on his large estate, "El Cardal," in the Argentine. It was he who presented Mr. A. F. Tschiffely with the "Criollos" Mancha and Gato, thereby making it possible for Mr. Tschiffely to undertake and successfully complete the very remarkable ride, requiring 900 days, from Buenos Aires to Washington. One of my objects in translating this interesting paper is to bring once again to the attention of American breeders and horsemen, especially those officers of the Army who are influential in the remount problem, the value of the Arabian and Barb blood which was the foundation of the North American pure mustang, unfortunately now lost to the United States through short-sighted lack of appreciation of its great value, as a native base on which to build an Army remount supply. South America, especially the Argentine, through the patriotic action of some of her citizens has saved her native horse. — T. C.
A horse-breeder of the Pampas. 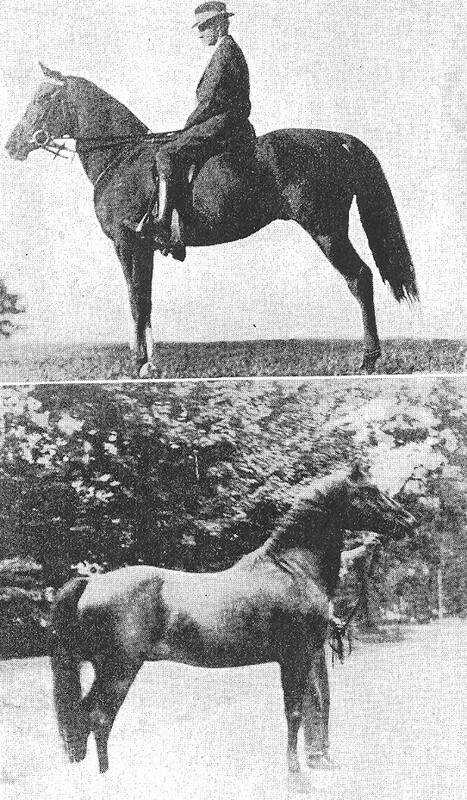 "Liempichún," an Indian chief, owner of the famous Argentine native studs, from which Señor Solanet selected the animals for his stud. 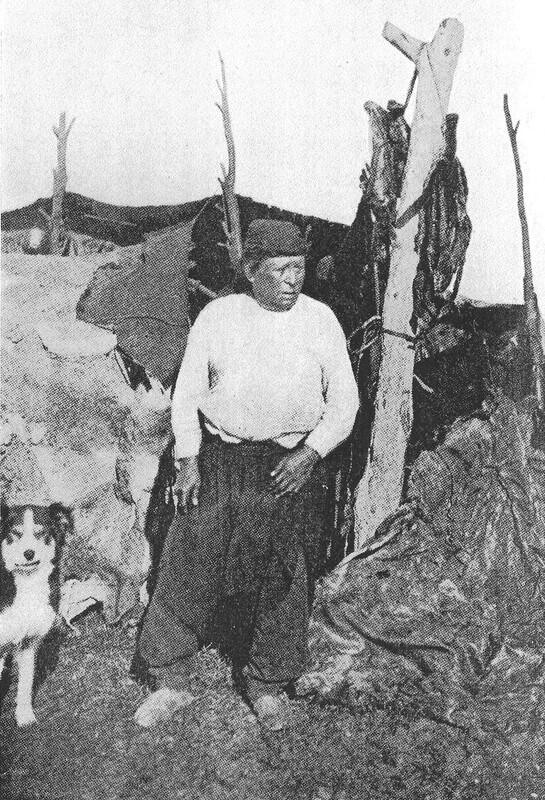 The photo shows the Chief in front of his "toldo" (tent) wearing the usual "chiripá" (wide trousers) of the Pampas. That the Spanish horse is the origin of the Criollo is proved by all evidence. Early Language: No vocabulary of any early American language existed for describing the modern horse. Therefore they did not have this animal. The Indians made up words such as "good thing" to describe the horse but never a real specific name. They had words for all the other animals that they possessed but for the horse they made up descriptive combinations. History of the Conquest: The conquerors found huts made of many animal skins except those of horses; also they found that the Indians were great walkers and runners showing that they did not know the horse. No pictorial or sculptural art shows the [modern] horse. Food products such as vegetables, fish and small animals were used but no large animal meat is mentioned. No historian has ever mentioned evidence of the horse before the time of the Conquerors. Domestication of horses is a constant fact wherever man and horse cohabit. (Note 2) Therefore the admiration and surprise of the Indians caused by the mounted men and the fact that they considered mounted men supernatural beings - believing man and horse were one being - show that they had never before seen the horse. (Notes 3, 4, 5). Conformation of the Race: The external forms which I have noted in the two types which comprise all the Criollos of Uruguay, Argentine, Paraguay and Chile coincide with the dominant races in Spain up to the year 1500, that is, they may be the African or Asiatic types brought by the Moors and placed on the peninsular during their long reign. Modifications of these races still appear quite perceptible in the Criollo especially in the cephalic characters. These are the most permanent, being least subject to change. The Arabian Type This picture is shown because most of the important breeds of horses, including the Criollo, throughout the world are indebted for the spirit and stamina to the Arabian blood. 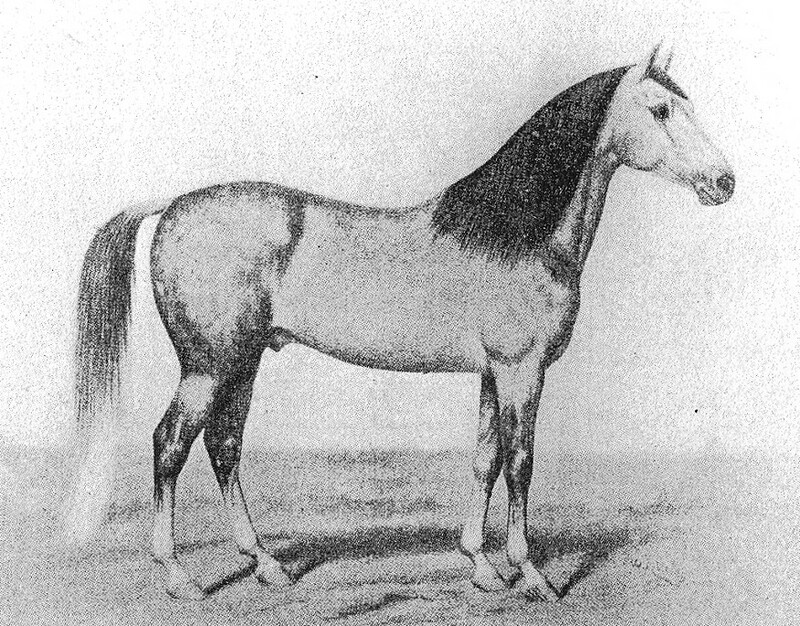 However, through an article in an Argentine Journal (Anales de la Asociación Criadores de Criollo, Buenos Aires, Sept. 1929) I feel bound to emphasize the suggestion that the excellent points of the Criollo and of the Mustang are due to the hardiness acquired by four hundred years of natural selection, quite as much as to the inheritance of Arabian and Barb blood. — T. C. From a photograph given to T. C. by the late Randolph Huntington. The first horses were brought to the La Plata River. Only the best were brought to meet the difficult conditions. The process of natural selection worked to form the race of Criollos. Poor digestion, weak heart, could not survive the dry seasons; poor lungs could not withstand the varying temperatures; lack of speed exterminated the slow. The long marches during many months at the time of the War of Emancipation were recorded in kilometers; 100 to 200 (62-124 miles) and even more were customary on the rides. Instead of being pampered, the horses endured hardships such as being burned by the sand-laden wind and eating thistles and coarse straw. The Criollos were valuable elements in the fight for independence, in war, agriculture and industry. On their robust backs our fathers amassed the wealth of the country. The renown of the Spanish horse has been attributed, largely, directly to the Barb, owing to the proximity of the Moors - whose horse he was - to Spain and to the fact that the invasion of Spain by the Mussulmans was by way of the country of the Moors; but it should be remembered that the Moors had already been conquered by the Mussalmans' generals from Damascus, which place, and later Baghdad, were the capitals of the Caliph who for years appointed all governors of the conquered Spanish territory, so that there was at all times direct transaction with Arabia and opportunity for horses from Arabia to be brought to Spain. Dr. Solanet directs attention to the two types, Arabian and Barb, found in the Criollo. After three centuries, which were years of natural selection for the horse, decadence set in. First on the ranches near Buenos Aires and then in all the zones of the country reached by the mixed breeding. Partly on account of this and greatly for the love of horseracing, crossing of the strong characteristics of the native Criollo with the thoroughbred race horse was an obsession, not only among the owners but even down to the stud grooms.